Entice butterflies to inhabit your garden using the Heartwood Small Butterfly House. This charming home features copper accents on the roof and above the door, as well as in a butterfly appliqué at the bottom of the structure. Butterflies are able to recognize shape, and this decoy entices them into the home to hibernate. A weathered look adds character to the cypress home, while the hand-shingled roof lifts off for easy cleaning and observation. This structure may be mounted on the included stake or placed on a flat surface. 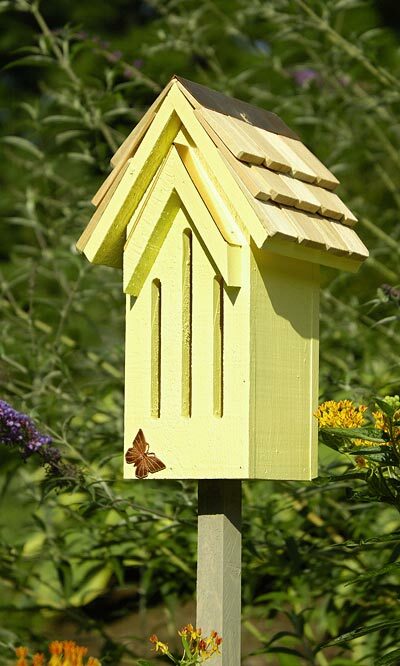 The Heartwood Small Butterfly House will add charisma and wildlife to any backyard sanctuary.